Cod liver oil is one of the most famous nutrient rich oil used these days. It is derived from the liver of Cod fish. This supplement is known for as a rich source of vitamin A, Vitamin D and vitamin E and Omega-3 essential fatty. Omega-3 essential fatty acids content in cord liver is beneficial for proper functioning of heart, brain, joints and the digestive system. Goodness of vitamins: Cod liver oil is rated high for being a rich source of vitamin A, D and E.
• Protection against Heart diseases. • Vitamin D content in the supplement enhances the strength and efficiency of your immune system, and decreases your risk of developing autoimmune conditions. • Cod liver oil can decrease inflammation and reduce the knee pain in arthritic patients. • Studies conducted by International Journal of Cancer showed, that cod liver supplementation for certain period of time has lowered the risk of death in patients with solid tumors. Is cod liver oil for everyone? Like with any other medication that we take, this supplement has to be taken under a Doctor's advice. Pregnant women and children should also consult the Gynacologist and the Pediatritian before consuming this supplement. 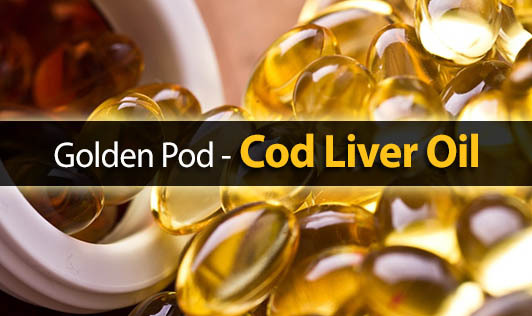 Cod liver oil may interact with certain other medications. If you're allergic to fish, it is better to avoid cod liver oil.